Johnson's New Hampshire and Vermont. 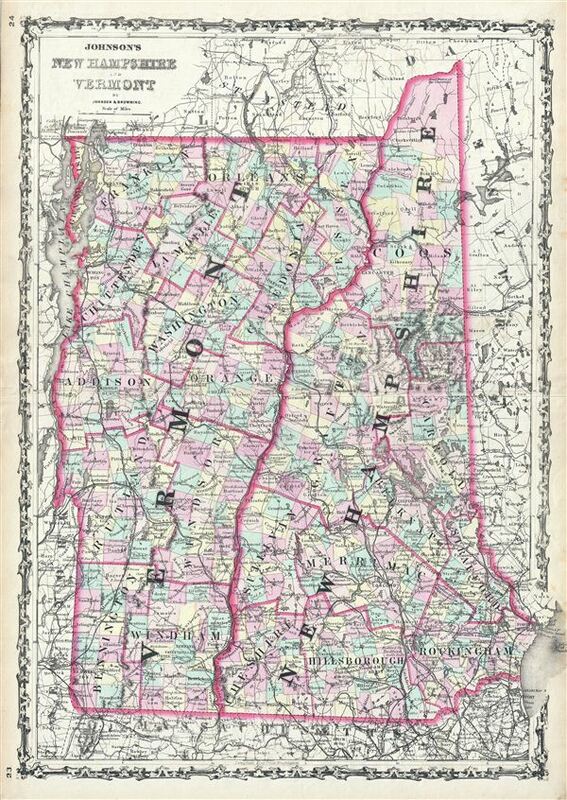 This is a beautiful example of A. J. Johnson and R. Browning's 1861 map of New Hampshire and Vermont. It covers both states as well as parts of adjacent states. This rare map offers a fascinating snapshot of these two New england states shortly following the outbreak of the American Civil War. It depicts the two states in stupendous detail with even individual buildings drawn in. This early variation of the Johnson map appears only in the 1860 – 1862 editions of the atlas. The plates for Vermont and New Hampshire were redesigned for the 1863 and all subsequent editions of the Johnson's Atlas. The map is color coded according to county and notes several towns, cities, rivers, railways and various other topographical details. It features the strapwork style border common to Johnson's atlas work from 1860 to 1863. Published by A. J. Johnson and Browning as plate nos. 23 and 24 in the 1861 edition of Johnson's New Illustrated Family Atlas. This is the last edition of the Johnson Atlas to bear the 'Johnson and Browning' imprint. Subsequent editions reflect Ward's 1862 acquisition Ross C. Browning's shares in the firm. Very good. Blank on verso. Minor wear along original centerfold.